A while ago I alluded to a particular new crush of mine. You probably thought my new love affair with pears was just that: an intense but fleeting moment of adoration. I don’t blame you. I went on and on about varieties and cooking techniques and hinted about pears taking over an entire week’s menu. Maybe I got you excited about pears too? That was my plan, anyway. But I was only able to share one recipe with you before eggs took over. Totally justified because it was all for a good cause, and I do love eggs. But I really want to get back to those pears. Pears so sweet and juicy that they can only be eaten while standing over the sink, lest you desire nectar dribbling down your chin. Pears that are crisp and just sweet enough to add a touch of sugar to peppery meats and stinky cheese. Little pears and big ones, pears the colors of rubies and peridots; this most versatile fruit deserves a boost on autumn’s ladder of choice seasonal produce. It’s no secret that I like a little sweet with my spicy, savory food, so pearing my favorite autumn (or all the time) vegetable which is sweet and creamy on its own with pears and chorizo sausage was one of the first things that came to mind. I love all winter squash and don’t discriminate, but I chose buttercup for this dish because it doesn’t need to be peeled, and it has the most sweet-potato-like taste and texture of all the varieties, in my mind. A bright, crisp Anjou pear would hold its shape against the heat of sauteing, and add just the right amount of honey-tinted contrast. If my poached eggs look a little funny to you, it’s because I finally accepted my inability to poach multiple eggs on demand and ordered a couple sets of these poach pods, a nifty gadget that does the trick for me. In a nonstick skillet over medium heat, heat olive oil until shimmering. Saute onions until soft and translucent, about 7 minutes. Meanwhile, place the squash in a covered, microwavable dish with 1 tablespoon of water. Cook on high for 3 minutes, until just tender. Add the squash, pears, chorizo, cinnamon and coriander to the skillet with the onions. Increase heat to medium high and cook for 5-8 minutes more, stirring occasionally, until heated through and browned. Serve hot with poached or fried eggs, if desired. Anything with chorizo these days and I'm in!! This sounds so super good, printing now…perfect for holiday breakfasts. Your blog finally caught up with your love affair with pears! I love how you used soy chorizo.. I should make my own again.. they are so flavourful and can be put into so many dishes! 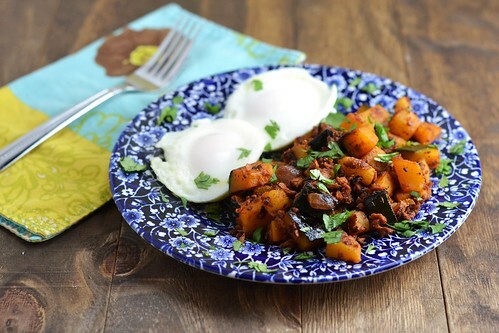 I actually LOVE that soy chorizo! I've never had the real thing, but all I know is that the soyrizo tastes fabulous. Sweet and savory is totally my kind of meal, as well. You did good, my love. My friend gave me a set of those poach pods for my birthday this year and I *love* them! They make having the perfectly poached egg as easy as boiling water. Except when I forget the non-stick spray. Heh. I hear good things about the soyrizo at TJ's, I'll have to check it out! Sounds delish! 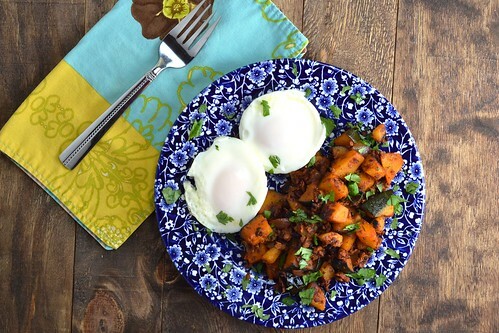 I love how you incorporated pear into such a savory dish… and paired them with eggs. I would never think to use pear as potato. I love the soy chorizo from TJs! I use it for stuffed peppers, but this is a great idea! This is exactly the kind of meal that I would love. So many of my favorite ingredients! I swear I could eat fall foods all year and be a happy girl. The addition of pear in there just sounds amazing! I'm also really loving the seasoning combination of coriander/cinnamon. Sounds fabulous. What a creative combination of sweet, savory, and spicy ingredients! I never would have thought to throw pear into the mix here, but now I really want to try it. I'm attending a vegetarian brunch tomorrow, and this is going to be a pear-fect contribution to the potluck menu! Love, love love! This is right up my taste buds alley and one I can feel good eating. I make hashes all the time, but never with chorizo. Love this. 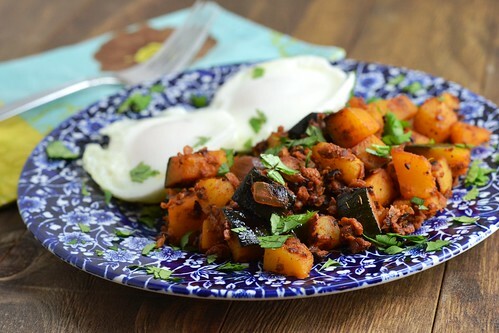 i do love a good hash, and this one definitely has a lot going for it! great and interesting combination, cara! Thanks again for all the inspiration and teaching me about pears!